Larissa Explains It All...: A NEW CAR! I've never purchased a car in my life. Until Monday March 19, 2012. Back in 2003, I started thinking about letting go of my '93 Honda Civic EX in favor of something with a little less oldness. I mean, isn't a right of passage after college graduation getting new wheels? Yet, I'd look at cars and not get that excited feeling one gets when they know they are making the right decision. Every time I have toyed with the idea for the past nine years, I immediately feel, "But my lil '93 is doing just fine!" About three weeks ago, a flip switched inside of me and I somehow knew it was finally time. I argued with myself. I loved having such a cushion in savings. I loved knowing my vehicle so well that I could explain every grunt or groan. I loved my insurance payments of about $400 for the entire year. I loved not having to worry if someone bumped my car or scratched the paint. The list goes on and on. That '93 Civic EX has been from one coast to the other, east to west and north to south. That '93 was with me all through college. Every man I have ever kissed, I have kissed in that car. Hmmm...given that last reason, I guess it is high time for a fresh start. Once I started looking for cars, researching, practically interviewing anyone and everyone who had a newer car, I could not contain my excitement. All I could think about night and day was, "New car, new car, new car, newcarnewcarnewcarnewcar." This is highly unusual for practical, budget-conscious little me, so I continued to move forward with this thing I have been looking forward to being right for nine years now. I narrowed my options down to three - used Honda Civic (cash), new Subaru Impreza (finance $6,000), new Hyundai Sonata (finance $6,000). I test drove and test drove. After all the research and test drives, I thought I wanted a Sonata SE with the works, but couldn't seem to talk myself into being okay with having debt, even if it is for a car. On my way home from car shopping last Saturday with my mechanically-inclined friend, I saw a Civic EX in the color I wanted on a lot with over 30 other used Honda's. We pulled in and looked it over, alas, it was closing time, the price was a little steep, and we were exhausted (I always giggle when I use the word "exhausted" whilst talking of cars). From that moment forward, all I could think about was "LittleblueHondaCivicExLittleblueHondaCivicEx," so during my lunch break from work on Monday, I headed over to the dealership. Sure it was above my cash price-range, but what's the worst that could happen? Sure, I could have gotten an Lx in a different color for within my price-range, but if the difference is $1000 and I'm spending thousands already, I want the one in the color I want with a sunroof, additional more high-end features, and less body damage, dang it! I drove the Civic for twenty minutes. It made sense. I wouldn't have to make payments, it would be mine, I know Civics, I trust Civics, they have a very high resale value, the maintenance is lower compared to Subaru's, they are more reliable than Hyundai's, the replacements parts are relatively inexpensive, and this one is under warranty until 60,000 miles. I didn't fall in love. But I felt very calm and peaceful - which to me is much more of a real and certain feeling than the adrenalin of love. No weird noises or vibrations, no brake noises, no catches, no clunks, no nothing. I went into the guy and said, "Listen I have to get back to work, but here's the scoop. I like this car. The sticker is $XYZ. If we can get this to $sameXYZ out-the-door I will buy it right now. That's all I've got. He said, "Well I can take the base price to $500lessthanXYZ, but after taxes that still leaves you at $XYZplus1200." "Man, well. If the car is still here in a month after I've saved another thousand, I'll be back. Can I give you my information so you can call me if we can make this work?" He said, "Well wait a minute. What's that you are driving? Are you interested in a trade-in?" I looked at him and said, "If you give me enough for that '93 out there to make my out-the-door price under $XYZ, I'm sold." He took Poopers for a test drive and came back and said, "Listen, that car is not worth $1,000. It drives nice and tight, you've taken VERY good care of it, tell your mechanic friends they have done a great job. But the body defects are pretty bad." Yeah. Duh. He said, "Well...if it'll get you in the '09, I'll give you $1,000 for the trade-in because I can probably sell it for $1,200." The most a dealership had offered me for it previously was $400. Yep, it's an awesome day when you find out your couch is worth more than your car. We did the math...and the total price came in to just under $XYZ. There is a funny thing that happens when you buy a car. All of a sudden, you make this decision and *bam* that's it. You are in a committed relationship that you can't back out of. You are $XYZ out of your savings. You have this new machine that will be a part of your life every single day. The friendship you built with your old machine for thirteen years is now over. Done. Just like that. I knew that old car in and out - every noise, every whine, every positive, every negative - I knew that car. Then in a matter of moments, I'm giving it up in favor of a new relationship. I still feel kinda like I'm cheating on the ole '93 and now I have to get to know something new - that's hard work! The drive home and back to the dealership to get my title and extra key were the longest fifteen minutes in recent memory. Less than 30 minutes later I was the owner of a shiny blue '09 Civic EX. Yes, I left on lunch break and less than two hours later returned to work with a new car. The other good news? My '93s gas tank was on empty (totally on E), I was supposed to get an oil change Saturday morning but ran out of time, and I was also due for Safety and Emissions. SO, had I done all that on Saturday like I intended, I'd have been out another $110 or so. Nice for me. Maybe that is way more than you ever wanted to know about my car-buying experience but there you have it. Way to go! Congrats on the new car, and doesn't it feel great? LOVE! What a cute little new car! Well, that’s the smart thing to do before buying a car. First, find out what qualities you want to find in the car you want to buy. Second, identify which cars have the qualities you want, and list them down. Third, go out there and actually test drive the cars you listed down. That way, you actually test out all your options, and you get a better idea of how to go about your decision. I think you really landed a great deal with your Civic. How is the car doing? Does it still perform like the first time you used it? I experienced a little bit of buyer's remorse, but now that I have had some time with the car, I love it. The average gas mileage is higher than my '93, the worries of "I can't go somewhere because my car may not make it" are totally gone, my worries of "I am a business professional, what will people think if they see me in this hunk of junk?" are gone, I love the new technology features, I love how much more power the car has, I love the handling, etc. Civics do have some vibrations and noises that I would prefer not be there, but everything is running as it should. I love the color and regularly get complimented on my choice there. “Yep, it’s an awesome day when you find out your couch is worth more than your car.” – This made me laugh! But it’s good that you really did take good care of your car, since it paid off in the end. 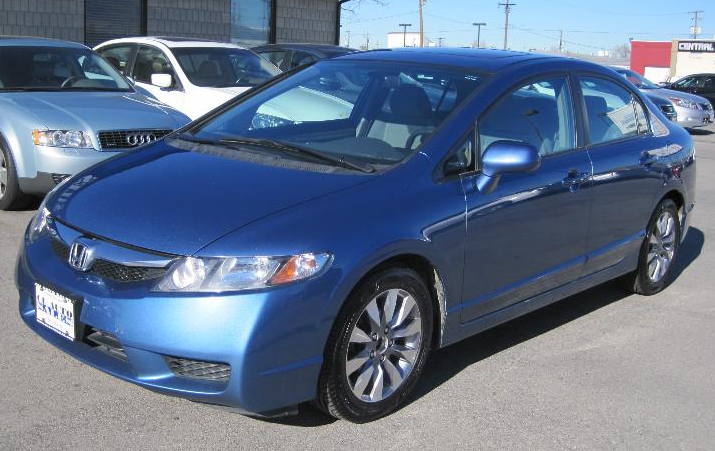 And now, you’ve got yourself a pretty shiny blue Honda Civic! Also, I admire your stand about avoiding debts. Debts can be pretty tricky sometimes. The interest rates, surcharges and hidden charges can go overboard. So, dodging it altogether is a safe choice. That was like magic, Larissa. Hehe! Ya, that's quite hilarious, Maria. When it comes to buying a car, it's always best to research about the car that you're interested in buying. Also, don't forget to research about the car company; if you're about to buy a used car, that is. By the way, both of the Civic models look good, but the blue one's shinier. Funny story! =D I But, on a more serious note, you shouldn’t be frazzled about buying a car just because you are being coaxed into buying it. You should take your time, establish a realistic budget, and identify what you need from a car. Locating a convenient dealer which offers ideal financing is one major plus.